Wichita police have arrested a 25-year-old online troll who calls himself SWAuTistic, charging him with involuntary manslaughter after sending police to a Kansas address. When police arrived at the address they opened fire on the resident, a father of two named Andrew Finch. SWAuTistic, real name Tyler Raj Barriss, could face 11 years in prison. SWATting is the process of calling in a fake hostage threat to local police who, ultimately, are expected to react with a SWAT team. Barriss boasted online about the number and frequency of SWATtings he had performed. The practice usually ends quietly but in Kansas a seven-year police veteran opened fire when Finch opened his front door. SWATting is a popular threat with online gamers and SWAuTistic seemed to revel in it. 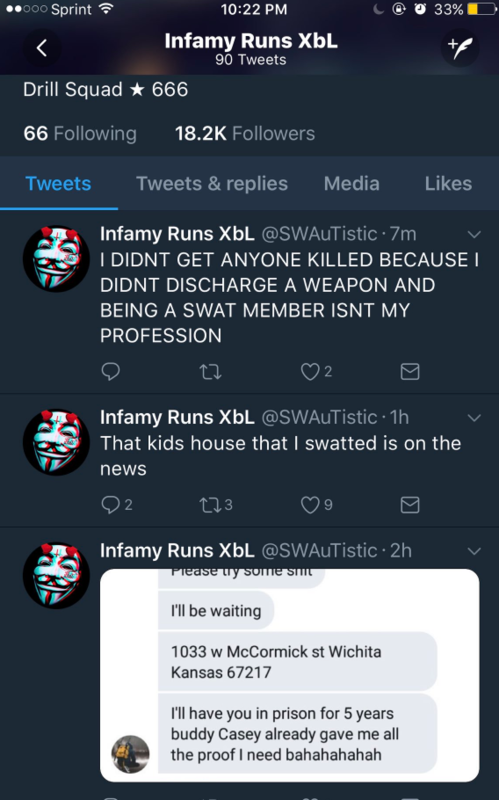 He called in this SWATting over a $1.50 wager in Call of Duty and claimed to have done at least 100 of them, targeting schools and homes. Reuters has further information. “Bomb threats are more fun and cooler than swats in my opinion and I should have just stuck to that,” Barriss told security researcher Brian Krebs after the incident. “I feel remorse for what happened. I never intended for anyone to get shot and killed,” Barriss told CBS television affiliate KWCH12 from jail.